This forward-styled 2005 possesses a dense ruby/purple color in addition to a big, sweet bouquet of roasted herbs, fudge, espresso, figs, and cherry jam. 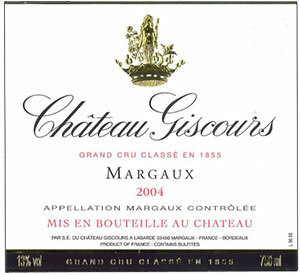 Opulent, even decadent, with low acidity, but high glycerin and fruit extract as well as a flamboyant fleshiness, this is a stunningly impressive, hedonistic, savory Margaux to enjoy between 2010-2025. The Château Giscours 2005 is more youthful in appearance than the du Tertre '05. The nose is more backward but possesses greater breeding: blackberry, raspberry, cedar and just a touch of blueberry developing in the glass, gaining in confidence all the time. The palate is medium-bodied with fine tannin. This feels dense in the mouth, understated at first but wonderfully proportioned towards the long finish. There is a great sense of energy here, real frisson. This is surely one of the best Giscours in recent years.